Ranks are a measurement of proficiency and are represented by a specific colored belt. The early ranks, called the kyu levels, are based upon the understanding and ability to execute basic fundamentals. Ranks are achieved by testing. Each rank has its own special test which involves the execution of specific fundamentals: Kihon, Kata and a Kumite designed for the rank. Kata is a predefined sequence of karate forms that help the student practice balance, timing and transitions to leverage the power potential of the body. 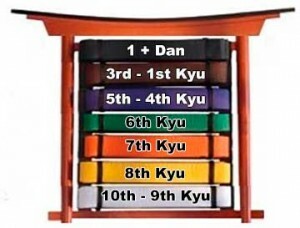 Typically, kyu grading takes place three or four times per year and Dan (black belt) grading sessions take place once per year. In order to be eligible for testing, you must first have gained the appropriate amount of continuous experience at your current rank. An example of what you may be tested on is shown below.